I'd like some help in setting up a 12200411 LS1B PCM for 700R4. I've done this before but forgot what I had to do? This one is a little more complicated by VSS that is an 8. So need to calculate that for proper speed which is needed for the TCC operation. Yes I know someone would do it for me, but that's not what I'm looking for. Looking for the knowledge to do it correctly and understand changes needed. This one will be done in EFI Live and the RoadRunner. 1990 Chevy Suburban 5.7L Auto ECM 1227747 $42! 1998 Chevy Silverado 5.7L Vortec 0411 Swap to RoadRunner! Thanks Buzz! This should be a good lesson! Truck should be here tomorrow for the weekend so I can read it. I'm wondering if the 700R4 has been modified? I've worked with a few 700R4's that had some internal wiring modifications done to allow a manual toggle switch to lock up the torque converter. What I remember about OBD I 700R4 TCC control ... when the 4th gear switch closes a ground is sent to the ECM. The TCC solenoid gets power from the brake switch. When all programmed parameters are qualified (usually TPS / MPH), the ECM will apply a ground to the TCC solenoid. I'm thinking EFI Live can be programmed to 100% PWM Min / Max for TCC control. I'm thinking MPH can be programmed for TCC lock up. I'm thinking most LS1B wiring I've worked with have Red 42 as TCC control. It's a stock 700R4 that came in the 1990 Blazer. Not sure what he did with the wiring yet? The only thing I did a few months back was remove VATS when he was installing the engine. It does run and drive. For the VSS, it's a Dakota digital 8k on NP208/700r4 adaptor. i don't know if referring to full-size blazer or the S10 blazer, but in either case.... looks like the same diagram used between a 4.3 blazer S10 and a 5.7 full-size S10. can probably ignore the TH400 section. brake switch is wired in series with the TCC solenoid, so brake application should always disable TCC, otherwise some kind of trans issue exists and is keeping it engaged. the way the temp and 4th gear switches are setup in the other diagram are kind of confusing, but maybe there is some reasoning behind it? not enough digital inputs available to watch them seperately? It's a full size Blazer. I'm pretty familiar with the wiring on that end, just forget what to do on 1220411 end? He says it's done, but I like to make sure things are done right and check operation, considering there's no noticeable sign of TCC lock up? But with the wrong VSS signal who knows what the speed is recording? I've never driven it and months ago it was a truck without a motor, 5.7L TBI and 5.3L sitting on floor. I don't know if this really works, because the vehicle I flashed the PCM with these changes is not on the road yet. I tried this once before, didnt make it work so I hooked it back up through the vacum switch. I believe the pcm needs to see the vehicle in gear before it will apply the tcc. Not having a prndl switch it will not see in gear. Might be able to make it work, I just found it easier to leave it with brake switch, vacum switch, 4th gear switch setup. Dave W - you figured it out (despite your lack of a road test) - with a pulse generator (typically being driven by a speedometer cable) would want the VSS pulses per mile (H0101 in EFILive) in the tune, to equal that of the pulse generator (4K / 8K / 16K). It doesn't matter what speedometer parameters you change to arrive at this value - as long as in the end the correct value is displayed. The PRNDL tells the PCM what position the gear shift is in - not what gear the transmission is in - there are two different PIDs in the EFILive ScanTool that correspond to gear shift position (GM.PRND) and the current gear the transmission is in (GM.GEAR). You could get an input to the PCM for the gear shift position with a 700R4, but not for the current gear (as it is a non-electronic transmission). TCC lockup ... is another issue ... most people who run a non-electronic transmission (TH350 / TH400 / 700R4) behind an LSx engine with a PCM, will either run a manual transmission tune, or an automatic tune with pretty much everything disabled. Obviously, a manual transmission tune cannot control the TCC lockup. An automatic tune could do this - but not without a proper transmission current gear signal - which the 700R4 cannot provide. Most people elect to simply have the 700R4 lockup in 4th gear only, as already described in this thread. Unless the vehicle is underpowered, or will be used for towing, there is no need to use a vacuum module as a component of the TCC lockup system. Ignition voltage routed through a brake pedal switch works just fine. i could grab it, but boy is it large, ugly and confusing for me. it was from the S10 blazer though.... can't find that exact style for the 90 full-size. different years.... maybe. Thanks but no need. Only interested if it was for 7747 type ECM. 90 blazer S10 4.3 might be 7747? Same C3, probably a 288 or 299? I'd like one for that if 700R4? If it's huge and hard to work with like you said we'll just pass. Buzz, mecanicman, Dave, thanks, I think I got it for the VSS. But TCC will only work in forth? With no speed? This I'm not clear on... I could get only one signal from P/N is grounded, when in D/R it is an open signal, could run that through relay. But no more, couldn't get all gears. Actually forth is fine and not even going to shoot for third. Truck has good gearing for 35 inch tires but I've had enough of these to know third is not worth it. 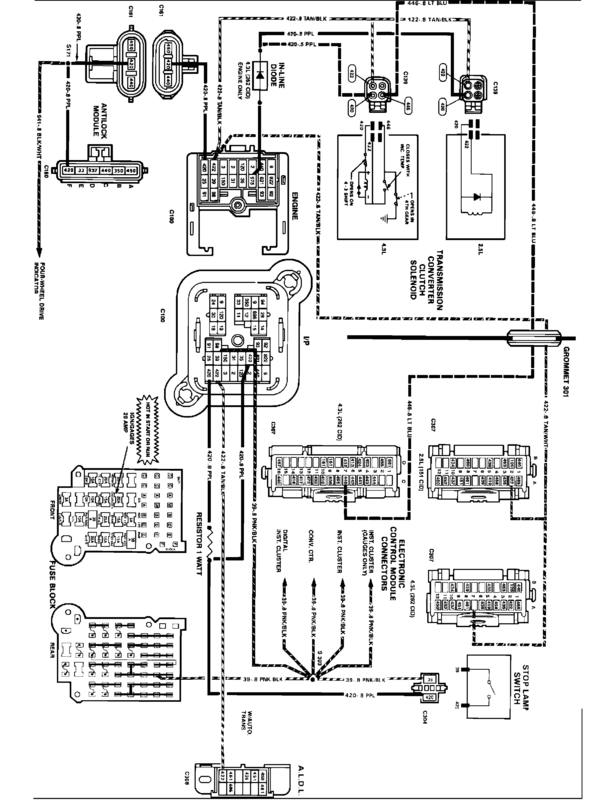 anyways, that style of diagram confuses almost as badly as the stuff chrysler released for most of their OBD1 vehicles. 16197427 and a 700R4 ?